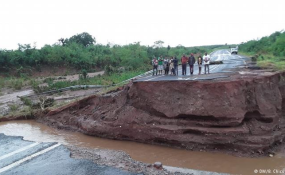 In both Mozambique (pictured) and Zimbabwe, sinkholes destroyed roads and flash floods washed away bridges. Thousands of people remain without food or shelter days after the storm made landfall on the coast of Mozambique. As communities struggle with the scale of loss, neighboring countries have pledged humanitarian support. Communities in Mozambique, Zimbabwe and Malawi are counting their losses after Cyclone Idai barreled through south-eastern Africa, leaving behind a path of destruction. The full scale of the devastation will not be known until floodwaters recede, however the United Nations (UN) says it is likely to be one of the worst storm-related disasters ever witnessed in the southern hemisphere. At least 2.6 million people have been affected by the storm, which caused severe flooding and landslides and destroyed thousands of hectares of crops. The floodwaters are still rising as torrential rain continues to hamper rescue and relief efforts and it will likely take days for the inundated cities and plains to drain toward the ocean. The current official death toll for all three countries combined is 354; however the overall death toll is likely to reach at least 1,000. Mozambique is marking three days of national mourning for the victims of the cyclone. The current death toll is at least 200, although officials expect this will rise significantly. The coastal city of Beira was particularly hard hit, with up to 90 percent of all infrastructure destroyed by the storm. The emergency response manager for Save the Children in Maputo, Deizi Sitoi, told DW that getting necessary aid into the flooded city has become a logistical nightmare for aid agencies. "The roads are not accessible, so it really is a challenge to get into Beira," she said. "Getting the supplies in is really difficult." Mozambique's Minister of Land, Environment and Rural Development Celso Correia told reporters on the ground that the rescue operation will continue to unfold over the coming days. "Rescue teams are preparing to fetch people stranded in flooded areas and islands to bring them to safe areas," he said. "We have enough medicine, but the big challenge is access. We are now using boats and helicopters. Once we have access, our work will be easier." Meanwhile, bus drivers in the capital Maputo are lamenting the fact that they have no passengers. "I had 14 passengers for Quelimane, but I had to drop them in Chope," one bus driver told DW. "There is no access to the city of Beira. Since Friday there has been practically nothing to do." Analyst Tagir Suleimane believes Mozambique's poor infrastructure played a role in the scale of the disaster. "Some of our infrastructure was built 50 or 60 years ago when technology was not very advanced," he told DW. "We have better access to technology now, but things are not happening as they should."